The Easy Fill is a manual water bottling machine used in commercial applications to sanitize and fill any bottle ranging from 500ml to 2 liters. 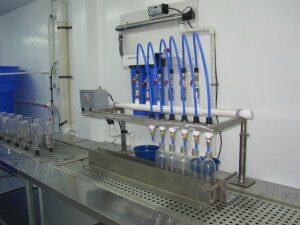 The Easy Fill manual water bottling station is most commonly used for 500ml & 1 liter bottles in commercial bottling operations. It is currently used worldwide and is very popular in areas with low labor costs such as Africa and Latin America. The Easy Fill manual water bottling machine is capable of producing up to 1,000 500ml bottles an hour with 4 labor workers tending to the filling line, making it very efficient and cost effective in areas with low labor costs. 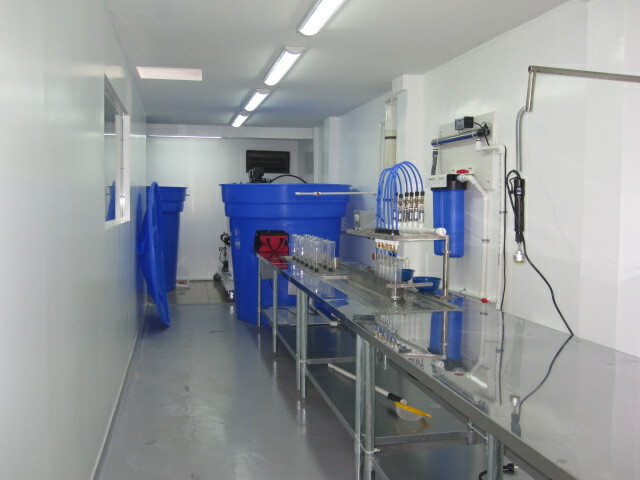 This manual water bottling station is capable of sanitizing 12 bottles at a time and filling 6 bottles at a time. The bottles are sanitized with ozone bottle rinses that use ozone and pure water to sanitize and rinse the bottles to prevent contamination. The Easy Fill includes a capping and labeling system allowing you to sanitize, fill, cap, and label water bottles all with one simple and trouble free machine. Also, the Easy Fill water bottle filling machine uses ozone injection when filling the bottles for an extended shelf life of the filled bottles and to prevent contamination while the bottles are being stored or shipped. This allows the water to stay fresher and better tasting without any negative effects. All of the stations and tables of the Easy Fill are made out of stainless steel allowing them to be very durable and rust proof. The work tables include a storage shelf below the table top allowing for storage of bottles or various supplies such as labels and caps. The Easy Fill is designed and manufactured in the USA with all NSF approved components to ensure a high quality and reliable design. The Easy fill uses no proprietary parts and simple electrical components to ensure reliability and virtually no maintenance costs. This water bottle filling machine comes with a 1 year manufacturers warranty on parts due to manufacturer defect and includes ongoing worldwide technical support via phone or email. The Easy Fill water bottle filling machine is the premier bottle filling option for commercial bottling operations worldwide, and has been proven to be very effective and reliable in a variety of applications. It can be used to fill any bottle or container up to 18 inches and can be used with any type of water such as reverse osmosis or alkaline water. The Easy Fill can be easily interfaced and used with any of our water purification or water filtration systems ranging from the Diamond Skid to the Alkaline systems. The Easy Fill can also be custom made to accommodate smaller bottles.